The second year of IoT Conference in Prague is behind us. Over 300 attendees shared a common interest in learning how to best harness the IoT opportunity. The IDC IoT Forum 2016 featured real IoT use cases presented by local project leaders and global technology providers, which provided practical scenarios for launching, developing, and enhancing IoT projects. This year there were presented the newest technology trends including RTLS, Vitrual Reality, Robotics, household and industrial Automation. 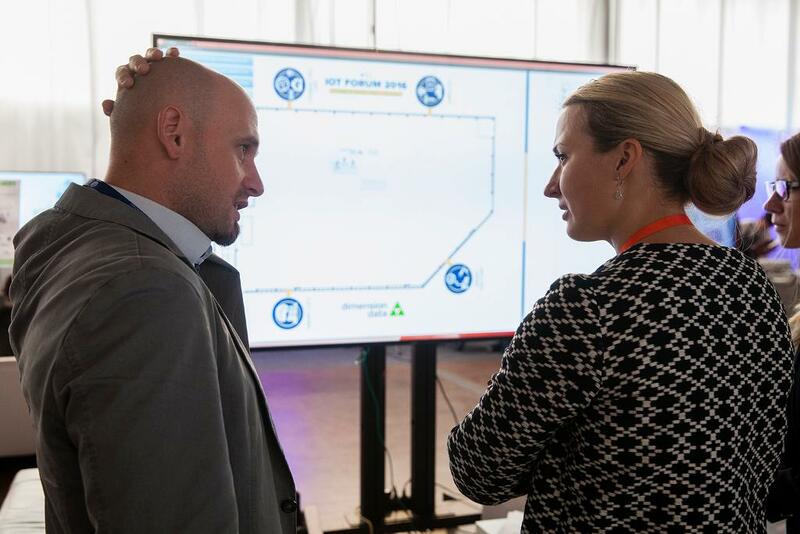 During the event there were presented many innovative technologies bringing IoT solutions within four sections: eHealth, Smart Cities, Smart Factories and Connected Life. Within these four specialized demozones there were presented ideas, smart solutions and technologies from companies as Microsoft, Vodafone, Cisco, Dell, Universal Robotics, BigClown and many others. This year there has been introduced an indoor localization technology powered by Sewio. Sewio´s RTLS indoor localization demo was presented by Dimension Data within their IoT Solution package. IDC engages in an innovative discussion about information and telecommunication technology through events, market intelligence and advisory services.